Posted on Sun, Oct 3, 2010 : 8:02 a.m.
Chris Armstrong and Andrew Shirvell are expected to come face-to-face in a Washtenaw County courtroom on Monday afternoon. The two men are used to seeing each other. For months, Shirvell, a state assistant attorney general, has been following Armstrong, the University of Michigan student body president, around campus and town to protest against him. Shirvell has appeared outside Armstrong’s Ann Arbor home, at a meeting of the Michigan Student Assembly and even staged a counter-protest to a protest Armstrong was leading. In this Sept. 7 photo, University of Michigan alumnus and assistant attorney general Andrew Shirvell speaks about the University of Michigan's student assembly president Chris Armstrong at a Michigan Student Assembly meeting. Armstrong, the university’s first openly gay student body president, last month asked the Washtenaw County Trial Court to issue a personal protection order against Shirvell. That order would bar Shirvell from talking to Armstrong, being in the same area as Armstrong or sending him e-mails or Facebook messages. It’s unclear exactly why Shirvell is targeting Armstrong, but the issue has intensified in the last week, thanks to national media exposure. 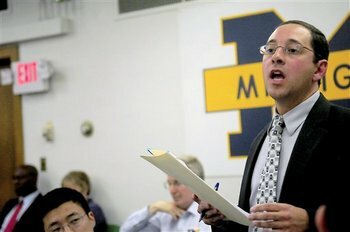 Armstrong and Shirvell have not returned repeated requests for comment from AnnArbor.com in the last week. When both sides make their arguments in court Monday, it will likely pit the words of a student who says he feels threatened against those of a U-M alumnus who says his actions are protected free speech. Armstrong called Shirvell’s words a direct threat in his letter requesting the order. “The actions that Mr. Shirvell has taken against me over the past four months have been incredibly distressing,” Armstrong wrote. He added he might feel slightly different if Shirvell was a student, but since he isn’t, “his actions are concerning and make me feel unsure about my own personal safety. At the hearing, Armstrong is expected to testify about the incidents detailed in the restraining order. And the judge must decide whether the actions constitute stalking, which is defined as repeated unwanted contacts in person, online, on the phone and by other means. 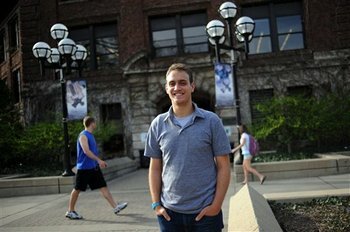 This April photo shows Chris Armstrong, incoming University of Michigan student assembly president. Shirvell will then be allowed to respond to the allegations before Judge Nancy Francis makes a decision on whether to grant the personal protection order. Shirvell told CNN’s Anderson Cooper last week that he isn’t breaking any laws and is exercising his free speech rights. Kary Moss, executive director of the Michigan chapter of the American Civil Liberties Union, said Shirvell’s free speech rights deserve to be protected — no matter the contents of his message. Shirvell’s boss, Attorney General Mike Cox, also has defended Shirvell’s free speech rights, saying that while his posts are “distasteful,” he has the right to make them. But Cox also said he was troubled the 30-year-old lawyer videotaped police breaking up a party at Armstrong’s off-campus home in Ann Arbor over the Labor Day weekend. Cox’s defense of Shirvell has also attracted national media attention. Facebook petitions are advocating for Cox to fire Shirvell, and Cox’s office has been flooded with e-mails and calls. On Thursday, Shirvell took a voluntary leave of absence from the office. Officials won’t say how long that leave will last or whether it is paid or unpaid. They did say he’s likely to face a disciplinary hearing when he returns to work, but refused to comment on what that hearing might center on. Shirvell and Cox have a long history. Shirvell worked in Cox’s office as an intern in 2003 and 2004. He got a full-time job there in 2006 when he graduated from Ava Maria School of Law. Campaign finance records also show Shirvell has given more than $400 in donations to Cox campaigns, including Cox’s unsuccessful run for governor this year. The Associated Press and AnnArbor.com reporter Kyle Feldscher contributed to this story. David Jesse covers higher education for AnnArbor.com. He can be reached at davidjesse@annarbor.com or at 734-623-2534. Mon, Oct 4, 2010 : 10:59 a.m.
Mon, Oct 4, 2010 : 10:43 a.m.
@trespass: Your quotation of the Supreme Court decision on harassment of abortion clinics is incomplete and distorted. The Court did indeed rule that protests are legal, but it set fairly stringent restrictions: It set limits on the number of protesters, said they must stay 300 ft away from the clinic, and forbade them from addressing anyone headed for the clinic unless invited to do so. The same stipulations undoubtedly apply to the synagogue stalkers of Ann Arbor, though they have not been enforced. "Harassment does not include constitutionally protected activity or conduct that serves a legitimate purpose". Please explain why you consider stalking to be a "constitutionally protected activity" and why it "serves a legitimate purpose". Mon, Oct 4, 2010 : 10:05 a.m. It seems that Chris Armstrong is simply getting a taste of his own medicine. He's been a provocative, "in-your-face" presence advocating for his political agenda. Now Andrew Shirvell is using those same tactics against Armstrong. How can Armstrong complain, when Shirvell is simply doing what Armstrong has done all along? Mon, Oct 4, 2010 : 7:38 a.m. Thanks for the links, Ed! I think it is difficult to generalize an outcome from any ruling on stalking or harrassment. The reason being that the individual facts are so determinative. Change one and you could get another ruling. I would not be suprised that the outcome was appealled by the 'losing' party regardless. That said, I think the actions by Shirvell are outrageous and disturbing. Cox has a long history of being opposed to gay rights and it is clear that at least one of his supporters has gone way over the top. Free speech is not consequenseless speech. Shirvell's right to express his opinion is unquestioned. The consequense of that expression is a weakening of trust by an entire class of people in the Attorney General's office. Cox could have retained that trust but chose not to. Fortunately they are all lame ducks. Mon, Oct 4, 2010 : 6:06 a.m.
@denise1inannarbor- abortion protestors have certainly picketted the homes of doctors and been found to be within their constitutional rights. It would be helpful if the AnnArbor.com staff would clear up the situation referred to as protesting at his home. I think it refers to Shirvell videotaping the police breaking up a "rush week" party at his fraternity house. Is there really an expectation of privacy at a party in a fraternity house? Mon, Oct 4, 2010 : 12:38 a.m.
Do not compare the Catherine Wilkerson case to this one. Dr. Wilkerson quit the Temple Beth Israel vigils on her own accord long before she left the Packard Clinic. She refused to sign a contract with the clinic limiting her outside activities. The ACLU recommended she be given an opportunity to sign a new contract, but the Packard Clinic balked. Look what happened to Margaret Connors, the Washtenaw County Assistant Prosecutor who tried the Catherine Wilkerson case. She ran for district judge and lost eight months after the trial, finishing a distant third in the primary. Joan Lowenstein, who introduced the City Council resolution criticizing the Temple Beth Israel vigils and also held a "Don't buy their baloney" placard in front of the People's Food Co-op during the Boycott Israel Goods campaign, likewise lost in a landslide. Don't look now, Bedrog, but a former Huron Valley Greens member, Steve Bean, is running for Ann Arbor mayor and his campaign manager, Huron Valley Greens member Pete Schermerhorn, has supported the vigils; Ann Arborites luuuuuuuuuuuuuuuuuuv Steve Bean. Polls project Dr. Aimee Smith with the highest percentage of any 15th Congressional District third party candidate. Lastly, the Shirvell case is one which has no precedential effect as it is only one judge in the five-judge circuit issuing a ruling. Further, expect Judge Francis to be a supporter of Free Speech. She is the daughter of former A2 mayor Democrat Al Wheeler and her family ahs a committed background to enforcement of constitutional rights. Expect for Gary Shirvell to walk with his head up after winning tomorrow afternoon. Cheerio! Sun, Oct 3, 2010 : 6:50 p.m. This is stalking and harassment, not free speech. Shirvell should be fired ASAP. He doesn't deserve a "disciplinary hearing". What rang major alarm bells for me is the fact that Shirvell went to Ava Maria law school! Are these the kind of people they are letting practice law? Sun, Oct 3, 2010 : 4:43 p.m.
Mr. Jesse states; "the judge must decide whether the actions constitute stalking, which is defined as repeated unwanted contacts in person, online, on the phone and by other means" What Mr. Jesse does not include is the remainder of the definition of harrasment in the state law, mcl 750.411i, which states "Harassment does not include constitutionally protected activity or conduct that serves a legitimate purpose". It is hard to believe that such an obvious ommission is not biased. Compared to the harassment that certain physicians who perform abortions have been subjected to and which has been found to be constitutionally protected by the Supreme Court, the blog, the protests and even the videotaping of the police breaking up a party at his fraternity, pale in comparison. I wish Mr. Shirvell would not do what he is doing but to say it does not fall under the scope of political speech would be to ignore the law that has already been established by the court. Sun, Oct 3, 2010 : 4:11 p.m.
jim...re your nuanced defence of the ACLU ( of which i used to be a member)in this case : as i've said elsewhere, the organization is like a schizophrenic fireman who's also a pyromaniac. Sun, Oct 3, 2010 : 3:12 p.m. It has been reported by the AP and others that Kary Moss of the ACLU further stated that if Shirvell is found to have taken actions such as criminal harassment and stalking, "law enforcement can and should get involved." This article's omission of this part of Moss's statement gives the incorrect impression that she opposes Mr. Armstrong's request for an order of protection. Sun, Oct 3, 2010 : 2:50 p.m. I reject the ludicrous mis-definition of 'speech" by Cox and the ACLU. Speech ("free" or otherwise) is vocalization, not stalking with a video-cam. The First Amendment had to do with expressing opinions, trying to convince someone by argument, not with harassing those one disapproves of. And, once more, it only guaranties no prosecution for protected speech (not for all actions associated with it). It is not a "get-out-of-jail-free" card for anything perpetrated beyond the speech. And it does not preclude being fired. Sun, Oct 3, 2010 : 1:41 p.m.
when did "free speech" become a synonym for "creepy behavior"? Shirvell is allowed to dislike Armstrong and his alleged "radical gay agenda," but he's not allowed to stalk him. seems pretty clear to me. Sun, Oct 3, 2010 : 1:37 p.m.
Let me add a further instance to the precedents listed by bedrog: US Senator Chambliss, a very conservative Republican, had an aide who made a homophobic speech. Chambliss promptly fired him, sending the message that Chambliss disapproved of the action and did not want to be associated with it. End of story. Faced with not merely a speech but a whole sequence of questionable behavior, Cox punted. As the offensive actions were committed by a high-ranking member of the AG's office, I wonder whether Cox's detachment can be considered dereliction of duty. Sun, Oct 3, 2010 : 1:15 p.m.
"Shirvell will then be allowed to respond to the allegations before Judge Nancy Francis makes a decision on whether to grant the personal protection order. Shirvell told CNNs Anderson Cooper last week that he isnt breaking any laws and is exercising his free speech rights." The issue is not so much freedom of speech, but more about stalking. I mean really, video taping his house at parties. Following him around, trailing his friends and family. Tracking him down on facebook and sending him messages and e-mails. I am a big guy but i would be nervous too. The next thing you know Shirvell is going to break into this guys house and boil his pet rabbit ( in reference to the movie Fatal Instinct). Plus Shirvell not only represents the AG but also the State of Michigan. There are certain restrictions on State employee behavior regardless of Freedom of Speech.